Just a reminder that our 5-Week Workshop on Chakras & Auras starts this Saturday, November 7th. This is a great way to learn about your Chakras, open or close your Chakras, release old energy that you are holding on to that is blocking you from moving forward and how they correspond to your Aura. This workshop is for all levels; beginners to the advanced. I am excited to announce our 5-Week Workshop on Chakras & Auras. I held a 2-Week workshop earlier this year but it wasn’t enough time to really do deep healing work. 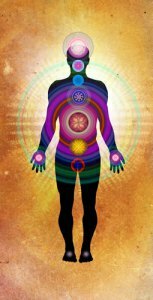 In this Chakra & Aura class we will focus on each Chakra and I will guide you through meditations for healing, clearing and aligning each Chakra. vitality, and access to guidance. We look forward to having you at our event. This entry was posted in Aura, aura clearing, Chakra, Chakra Balancing, Meditation Classes, Workshops and tagged blocked chakra, chakra balancing, change your energy, closed chakra, energetic boundaries, energy field, guided meditation, let go, meditation, open your chakra, release negative energy. Bookmark the permalink.